I'd really like to just have a whole bag of these in my purse, so I can just pass them out to people I know who could really use one...emergency first aid, so to speak. But most of all, I'd give one to myself, because I am feeling the Christmas crunch right now, and no amount of chocolate is making it better! SAY NO to something today. Sit down on the couch with your feet up for five minutes. Do something deliberate to lessen the stress that is being put on you or on others. Aren't they amazing? And you could win this...just for chilling????? I will announce the winner Friday. Yes those cards are amazing and I love picturing the faces the people you described would have if you handed them a giant chocolate chill pill. Time to get of the computer like you said! 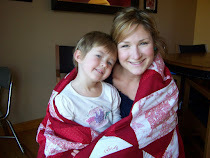 Does saying no to my children count? Those cards are gorgeous! 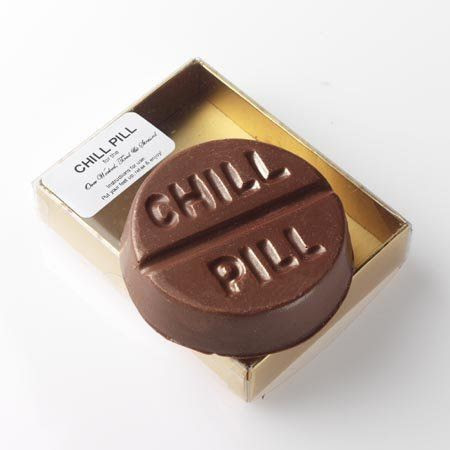 I love that chill pill. I am a devotee of the chocolate fix. Good post. love it. I just said no to baby sitting and sewing a dress for this weekend yes this is Wednesday and hey wanted it for a party for Saturday no fabric and pattern yet even. that was an easy no. And i am chilling this afternoon and watching Christmas movies and making a craft for myself for once. I am not sure it is legal to tell a single-mother law student in the midst of finals to "chill." But, happily, I did just that and relaxed and spent some time with my daughter without studying last night! It was so worth it. Merry Christmas! I am or have done everything on that your list today. I am getting ready to get off line right after this and go take a nap! (I worked my one night a month part time job pulling tags and putting up new ones at a local grocery store. Doing that is my little security blanket. I can't give it up completely because what if we need me to work...Really it is a tiny bit of lack of faith on my part...I will work on that later. Sorry I am rambling that is what no sleep does to me...or makes me do even more...) The money I make from that shift will be my last gift and I am done!!! It is mostly a homemade Christmas at our house and a refocus on the Savior and I am loving it!!!! By the way LOVE the cards! Beautiful cards! Today, I am taking it easy after a crazy busy day yesterday. OK Jocelyn. You've talked me into it. I will change my self-imposed deadlines. What amazing cards! Also, where can I get some of that chocolate? ;) I worked out today. Surprisingly it was a great way for me to chill out. I am going to chill tonight by going out with the other members of my primary presidency along with our spouses for dinner and fun!! Until then I am cleaning my house so my babysitter doesn't think I am a slob! But I'm taking a chill break from cleaning to check blogs! Hey...I worked out. YAY for me. Wonderful advice! I would love to win! Rebecca was my roommate at BYU! Awesome! Even though I have a zillion things going on and I'm supposed to be packing, I took a 'nap' in my daughters room on a little futon reading a book as she tucked me in then fell asleep :) Merry Christmas! I am always so sad for the people who get overwhelmed at Christmas. I choose to say NO often and we always have it nice and relaxed. It hasn't always been that way, but I am greatful for it, especially because I know how it does feel to need a big chill pill. Those are cute, where did you find the chill pills? I'm taking a five minute break to read your blog before I go take a little nap, since all three of my little ones are down at the same time!!!! Ciara came home yesterday with a book from school, and it was the Paper Bag Princess - totally made me think of you! Jocelyn,this is exactly what our Relief Society lesson was about on Sun! Not freaking out over what we let stress us out at Chrismas. But that we should enjoy the beauty and the simpleness of the season. Hang in there and I will too! Haha! Thanks for the much needed giggle. Those are my kind of chill pills! Can I say no to the Relief Society Dinner I am in charge of tonight!! Love this post, and those cards are beautiful. Now I think I am going to put my feet up for 5 mins...ha ha! Funny post. It made me smile. I totally took a nap the other day. I was feeling overwhelmed and decided that I needed a break though. I felt a lot better when I got up. It's so true though how we need to reprioritize and decide what is truly important right now and what can just be dropped. I love your fun giveaways! This post was fun too! I have been going non-stop making presents, painting, church callings....I am sure you know what I mean! Tonight I decided to "CHILL" and then I read your post and it fit perfectly with my objective! Lol!